[D&D 2e] Lost Mine of Phandelver 1 A couple months ago, our D&D DM switched up responsibilities at work and stated he couldn't run our games for a while. He offered to let me run something while he got back in the groove at work. We play 2nd edition D&D, but I wanted to play the Lost Mine of Phandelver. I wanted our group to be part of a shared adventure experience, though we play an old edition. I can tell I'm going to have to step up the number of enemies listed in the adventure. From the southern end of the room, two forms began...flirting with the party. They approached Tankred in a haughty manner. Tankred suggested foul magic, and he attacked the forms. Vaervenshyael waited around a corner with her guns loaded and ready to fire. Her first shot missed, and the sensual beings were upon them. Vaervenshyael drew her rapier and lunged at the form on the right. She was distracted by the lusts emanating from the creature, but she managed to slay one, with Wilhelm's assistance, while Tankred killed the other. The party entered through two doors beyond the dead...demons. Inside, a large room held an 8 sided dais. In the middle was a pedestal with a grey flame flickering above. Harpies erupted out of the flame and attacked the party. I think it's fair to say that encounter tables are meant to be tailored for your adventure, your campaign, your world. If something on the table doesn't fit, you're not using the proper table. The tables in published modules usually fit because the author(s) have selected creatures that make sense for the adventure. Next: a random encounter doesn't mean a fight. That's what reaction rolls and reaction adjustments are for. (Remember that Charisma score you used as a dump stat...). Maybe the bugbears approach cautiously because they have recently been in one scrape and are in no shape to be in another. Maybe the barbarian encounter you rolled is a group who wants to trade. Tailor the encounter result to your game. 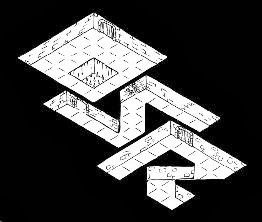 The party left off in a starry cavern with two rooms worked into the eastern side. One was on the level where they entered, and the other room was down a flight of stairs worked into an escarpment. They tried a door to the room near where they entered and ended up having a tea party with a slightly mad Beholder-kin. They left this room, headed down the stairs, and explored the room at the bottom. The door was cracked open, it's hinges melted. It took a couple of the stronger members of the party to pull the doors open. From the doorway, a scorched iron chest caught the party's eye at the foot of an old bed.